Protect your home from damages caused by storms and hurricanes with hurricane shutters from Storm Guard Solutions. Since 2004, Storm Guard Solutions, a Naples based, family owned and operated business has provided leading edge hurricane protection to homes and businesses in Golden Gate, FL. Your home or business is your most valuable asset. Living in South Florida it’s not a question of if we will be subjected to intense storms or hurricanes. It’s a question of when. 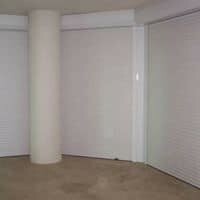 Accordion Shutters – Custom built for the openings of your home or business. 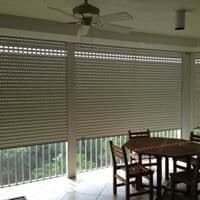 Accordion shutters provide protection from hurricane force winds and flying debris that can compromise your structure. Clear Polycarbonate Storm Panels – Stay out of the dark with clear storm panels. Old metal panels leave the interior of your home dark and they are very heavy and hard to install. Our clear storm panels protect your home from any flying debris during high wind storms or hurricanes. Aluminum Roll Down Shutters – Custom built in a variety of colors to match your home or business. Our powder coated aluminum shutters have been Large Missile Impact and Wind Tunnel tested to the highest Miami Dade protocols. 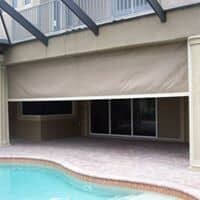 Storm Screens – Hurricane screens function much like an aluminum rolling shutter system and run on tracks. The significant difference is that hurricane screens will not provide the same security of “wind abatement system”, and will not protect glass behind the screen. Hurricane screens do provide the ability to transform a home or businesses architectural openings such as garages, large windows and patios into more usable living areas. They are ideal for garages, enabling you to have a screen room when you want it. Our team of experts have over 2 decades of experience providing quality hurricane protection in Naples and Southwest Florida. Our commitment is to provide our clients with superior products at fair prices. All our products are manufactured in our newly expanded and updated facility under strict quality control guidelines. Our shutters are custom built and meet all the standards of ASTM E 1866, E 1996, International Residential Code as well as State building codes. All shutters are tested to withstand a Category 5 hurricane. Our hurricane solutions and simple and affordable! Call today to ensure your families safety tomorrow.